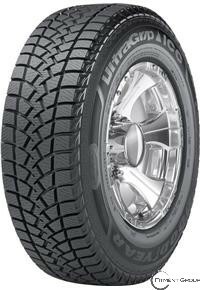 An innovative SUV/CUV winter tire for enhanced traction in challenging winter conditions. Specialized ice tread compound offers enhanced traction on ice and snow-covered roads from season to season. Two-dimensional blades in the center zone offer enhanced stopping and starting power on snow and ice. 3D TreadLock® technology blades in the shoulder zone offer enhanced wet and winter traction, locking together for confident grip in turns. Directional tread pattern helps channel water and slush away from the tire for enhanced winter traction and handling.